It’s Christmas Eve, sisters! With today being the vigil of Our Lord’s birth, I can’t think of a better way to thank Jesus for his great gift to us than by honoring the woman whose “yes” brought him to our world. I just did this through the St. Louis de Montfort version of the Consecration to our Blessed Mother. I was walking through some struggles in my personal life and trying desperately to put myself back in a place of peace. That’s the thing about finding yourself in the wrong direction–it’s hard to see how to turn or even understand where the wrong direction started. But this consecration has been spiritually cleansing, and has given me new hope. I pray you will consider it, too! I had started my journey to more intimacy with Mary with a couple “Mary, Undoer of Knots” novenas, which led perfectly to this consecration. I am certain the Blessed Mother called me to it and that my Father guided me as only the Holy Spirit can. How beautiful that in this messy, confusing, and painful life we have a Mother who is calling us back to Jesus! Just as she told St. Juan Diego, “Am I not here, I, that am your mother? Are you not under my shadow and protection?” How beautiful that our Lord has given her to us. From the agony of His cross, Jesus gave us a mother whose entire existence on earth and in heaven has been to lead us back to Him. Pick a day to start the consecration. More information can be found here. Find a good spiritual director. When we get serious about faith, we need someone to help guide us. Be honest with your director, so he or she can best advise you. Intentionally set aside time for prayer each day. Life is busy; our souls deserve that commitment of time. 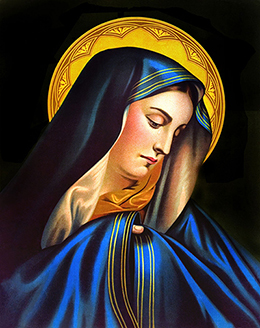 Read the “True Devotion to Mary” by St. Louis-Marie de Monfort. It is beautiful and eye opening. An audio version can be found here. Keep close to the sacraments. It was recommended to me to keep a running list for confession, which I felt helpful. I also went to confession weekly through the consecration period. Regular Mass attendance–add in some daily Masses if you can!–is important. Remember to recognize the living Jesus when you receive Him in the Eucharist. Don’t try to do this in your own strength. Recognize this is the work of Jesus and Mary. We can get in our own way when we focus too much on our sinfulness and not enough on Jesus’ mercy. Think more of letting the Holy Spirit envelope what is dark in us. We all have wounds and I found this process to bring them painfully to light, but it also can bring healing. Remember that praising Jesus is a type of spiritual warfare. If you find yourself getting down/afraid/worried/overwhelmed, praise the Holy Name of Jesus. Make use of sacramentals. This includes holy water, blessed salt, medals, scapulars, and other blessed items. Plan ahead. The daily prayers and readings can be found here. There also is an audio version at this site. Readers, have any of you done the consecration and have tips for others interested in doing it, too? Share them here! I’d love to incorporate your suggestions when I renew my own consecration next year. May God bless you on your journey and may we all come back to Him.